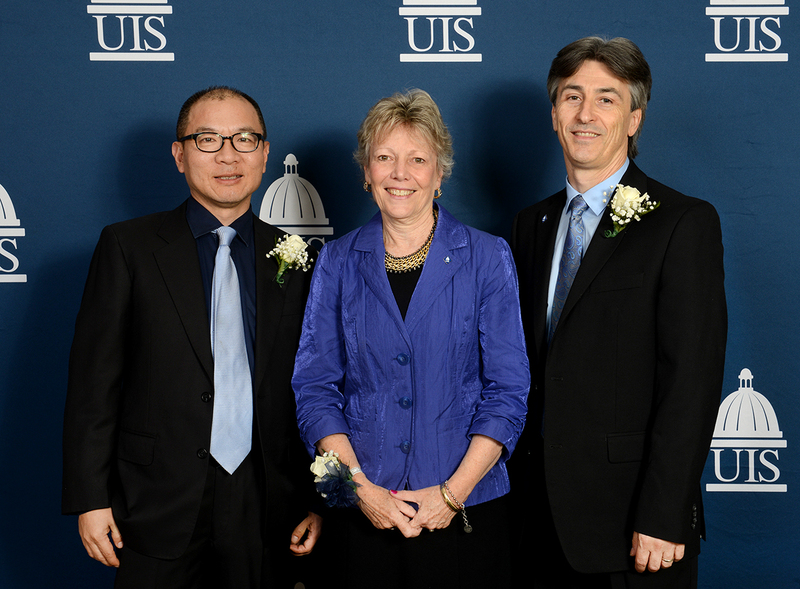 The University of Illinois Springfield honored the significant contributions of Wenguang Huang, Tim Randolph and Delinda Chapman during the university’s annual Alumni Gala on Friday, November 6, 2015 at the Abraham Lincoln Presidential Museum. The Alumni Achievement Award was given to Wenguang Huang, who earned a master’s degree in Political Affairs Reporting in 1991. Huang is considered the first international student to have enrolled in the program. Today, Huang is a writer, journalist and translator whose articles and translations have appeared in publications, such as The Wall Street Journal Asia, Chicago Tribune and The Christian Science Monitor. Through his writing and personal experience, Huang is helping the West understand China’s complex society and the strict traditions embedded in it, which often lead to conflict, misunderstanding or even persecution. Huang currently resides in the Chicago area and works for the University of Chicago. He has served as staff writer for the New York Times Beijing bureau, manager of media relations for Rotary International and speechwriter for the CEO of AON Corporation. He is best known for translating into English the books of noted Chinese dissident Liou Yiwu. Huang’s own memoir, The Little Red Guard, was released in 2012. He also co-authored the book A Death in the Lucky Holiday Hotel: Murder, Money, and an Epic Power Struggle in China. Tim Randolph was honored with the Alumni Humanitarian Award for significant contributions of leadership or service to improve the lives of others and the welfare of humanity. Randolph received a bachelor’s degree in medical technology 1983. He is a tenured associate professor and chairman of the department of Biomedical Laboratory Science, Doisy College of Health Sciences, at Saint Louis University Health Sciences Center. He is also founder and President of Randolph World Ministries, Inc., a medical mission ministry that establishes and develops medical services in existing clinics in Haiti. Randolph World Ministries provides a full range of medical services to over 20 Haitian clinics by offering training, materials, consultation, and personal visits to each facility; conducting mobile clinics in remote areas of Haiti where healthcare is unavailable; developing and implementing small business start-up companies to elevate individual families and grow a local economy; providing emergency relief following natural disasters and other types of urgent needs. Prior to his work with Randolph World Ministries, Randolph was employed as a medical technologist at Memorial Medical Center in Springfield. While earning his doctorate degree from Warnborough University, he developed a new diagnostic test for sickle cell anemia to be used in developing countries – a test which earned a U.S. patent. The Distinguished Service Award for extraordinary commitment, dedication and service to the advancement of the University of Illinois was awarded to Delinda Chapman. She earned a master’s degree in educational administration in 1974 and went on to earn a Doctorate of Education from the University of Illinois at Urbana-Champaign. Chapman, retired in 2003 as Deputy Director of the Illinois Department of Healthcare and Family Services after serving more than 20 years in state government and agencies which provide services to women and children. Prior to that, she spent much of her professional career in education, successively serving as a teacher, principal and superintendent. Chapman has also served as a volunteer leader at UIS, having served six years on the UIS Campus Alumni Advisory Board, and was a member of the National Commission on the Future of UIS. She is also a former member of the UIS Education Advisory Board and has frequently donated her time, talent and expertise to many efforts at the University, such as being a guest speaker for the annual scholarship luncheon. She has also volunteered as on air alumni talent for WUIS fundraisers. Her leadership throughout the community has raised the visibility and profile of the University and of higher education. For more information on the awards, contact Chuck Schrage, association chancellor for alumni relations at 217/206-7395 or cschr1@uis.edu.